Eastern Northumberland provided an easy north-south route for communication between Edinburgh and Newcastle upon Tyne, and onward to York and London. The only obstacles were the deep, narrow valleys of the rivers Tyne, Blyth, Wansbeck, Coquet and Aln, and the broader Tweed valley. The Great North Road followed this corridor, and from the 1830s there were schemes to build a parallel railway between Newcastle and Berwick. The Grand Eastern (1837) and Great North British (1839) were unsuccessful, partly because of objections by Morpeth tradesmen whose town the lines would have bypassed. In 1844 Tyneside and London were directly linked by rail, by a route through Leamside; the history of this ‘Old Main Line’ and its stations can be found on this website by clicking Leamside.Two years later the Edinburgh-based North British Railway pushed south from Scotland to Berwick, the most northerly town in Northumberland. Two rival proposals to close the gap between Tweed and Tyne came before Parliament in 1844. Isambard Kingdom Brunel (‘Father of the Great Western Railway’) proposed that the Northumberland Railway should pass through South Gosforth, Blagdon, Morpeth, Widdrington, Lesbury, Embleton and Chathill. He planned to apply his atmospheric system of propulsion for the trains, which was already installed on the Dublin & Kingstown and London-Croydon railways and was planned for the main line through South Devon. The other proposal was the Newcastle & Berwick Railway (N&B) backed by George Hudson (the ‘Railway King’) who was in the process of creating a railway empire in the Midlands and North East. He had technical support from George Stephenson, the Northumbrian engineer who had already secured his place in railway history through his work on the Stockton & Darlington and Liverpool & Manchester railways. The Newcastle & Berwick was successful, obtaining the Royal Assent on 21 July 1845. In the early 1840s the North British Railway was preparing to open its Edinburgh-Berwick route, and in 1847 Hudson attempted to add this company to his expanding portfolio. Had he succeeded the history of Northumbrian railways would have been very different. Alnmouth station looking north from a down train in August 1969. The station was opened in 1850 to be the junction for the Alnwick branch. In 1887-88 the North Eastern Railway largely rebuilt the station, though retaining the 1850 station building; the glazed verandah seen on this platform was part of the NER improvements. In 1892, after being known from its opening as Bilton (Alnwick), Bilton and Bilton Junction at different times, the station was renamed Alnmouth after the coastal village about a mile east. The water crane in the foreground will be noted as will the LNER electric lamp standard. The station ceased to be a junction in 1968 when the Alnwick branch closed, first for passengers and later in the year to all traffic. The goods facilities at Alnmouth closed in June 1984. The down platform lost its Victorian buildings by 1972, and in 1987 a functional building containing an office and waiting room replaced the old buildings on the up platform. 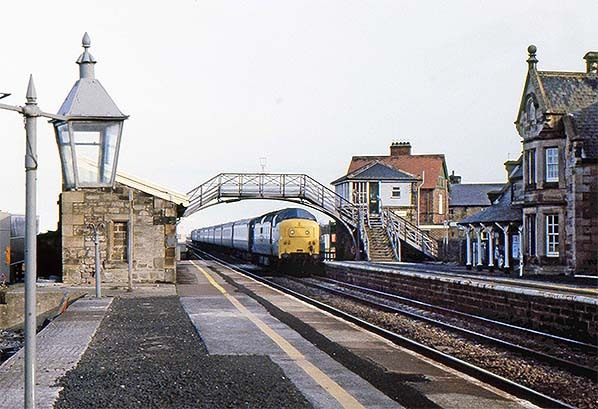 The station (now officially Alnmouth for Alnwick) is still open and staffed, and is served by local and long-distance passenger trains, including some London-Edinburgh expresses. The Newcastle & Berwick opened from a junction with its existing Newcastle–North Shields line at Heaton as far as Morpeth on 1 March 1847; Chathill–Tweedmouth opened on 29 March, followed by Morpeth–Chathill on 1 July 1847. Hudson had already shrewdly merged the N&B with the Newcastle & North Shields Railway in 1844, allowing the latter company’s Newcastle terminus at Carliol Square and the first two miles of the North Shields branch as far as Heaton to be used by what we now know as the East Coast main line (ECML). This piece of history explains why the ECML leaves Newcastle as if bound for North Shields and Tynemouth before a broad curve through a rural area takes it northwards to cut through Newcastle’s northern suburbs at Forest Hall. The line follows an indirect route north to Morpeth. Neighbouring collieries with mountainous pit-heaps were linked to the ECML by mineral lines and sidings. By the late 1970s most of the collieries and sidings had disappeared, and Killingworth and Cramlington new towns - created on the initiative of Northumberland County Council rather than by New Towns legislation – were added to the landscape of Victorian mining villages. Between Plessey and Stannington a viaduct strides across the Blyth valley. Entering Morpeth the ECML has a tight curve: a site of four accidents, three caused by drivers ignoring speed restrictions. After Morpeth a viaduct takes the ECML over the River Wansbeck then, for several miles, the route is indirect as it follows the most level course, thereby avoiding most of the area’s villages. Alnwick, central Northumberland’s principal market town, is three miles west of the main line. The grounds of Alnwick Castle stretched across any potential north-south route through the town, and the Duke of Northumberland would have preferred the railway not to cross them; however the local topography would have required expensive earthworks to maintain an easy gradient for the route, and this was probably the main reason for the route failing to pass through Alnwick. 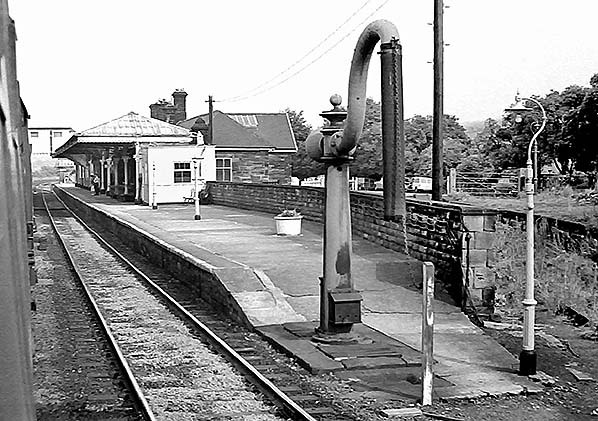 Lesbury station served as the railhead for Alnwick, but in 1850 a branch from Bilton Junction (known as Alnmouth station from 1892) reached the town, its terminus being a respectable distance south of Alnwich Castle. At Alnmouth the northbound ‘East Coast’ main line passenger - just over 300 miles from London - at last glimpses the sea beyond the sandy estuary of the River Aln. North of Alnmouth this river is crossed on a viaduct, and the journey continues through pleasant, sparsely populated farming country. On this gently graded route the steepest stretch (2¼ miles at 1 in 150) is encountered at Christon Bank, falling northwards. Near Beal there is a distant view of Holy Island (Lindisfarne) with its castle and ruined priory. Sand dunes flank the route to Goswick, followed by sea cliffs at Scremerston. Approaching Berwick the passenger is treated to one of the highlights of British railway travel: the Royal Border Bridge. The bridge is misleadingly named. Although the River Tweed, over which the bridge crosses, geographically provides the obvious route for the Anglo-Scottish border, since 1482 this has been fixed at Marshall Meadows, two miles north of Berwick. 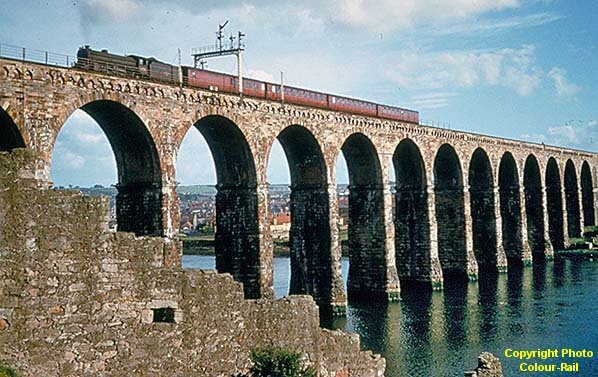 The names ‘Tweed Bridge’ and ‘Berwick Bridge’ had already been used for a seventeenth century road crossing. In August 1847 the Newcastle & Berwick amalgamated with the York & Newcastle Railway, and it was the newly-created York, Newcastle & Berwick Railway (YNB) which was responsible for bridging the gap between Tweedmouth and Berwick. The foundation stone was laid on 15 May 1847, under N&B administration. 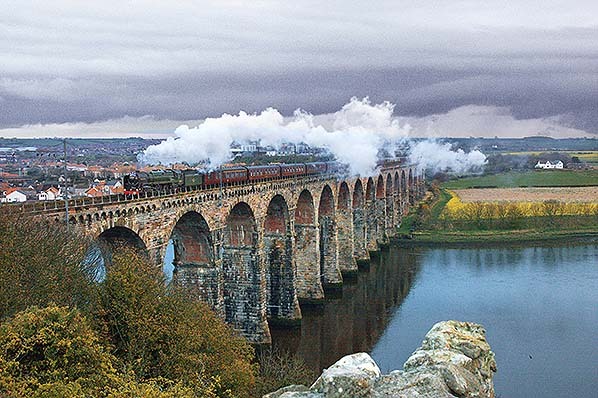 Train services began on 29 August 1848 over a temporary bridge across the Tweed, but the permanent Royal Border Bridge opened to freight on 20 July 1850, whilst the formal opening to passenger trains was performed by Queen Victoria on 29 August 1850. The 720yd stone and brick structure is gently curved, carries two railway tracks, and possesses 28 arches, each of 61ft 6in span, and only 12 of which are actually crossing the river. The maximum elevation of the rails is 120ft. To the credit of the architect Robert Stephenson, and contractors McKay & Blackstock, the bridge has required no major repairs in over a century-and-a-half. Regrettably, posts and wires added when the line was electrified have somewhat marred the bridge’s appearance. The structure is Grade I listed. Class B1 No.61220 heads a Newcastle – Berwick-upon-Tweed local train over the Royal Border Bridge in perfect weather on a June evening in 1959. Part of the town’s ramparts can be seen. No.61220 was a B1 4-6-0 Thompson-designed loco built in August 1947, at the close of the LNER era, by the North British Locomotive Company, Glasgow, and she originally carried the number 1220. On 4 October 1965 she was withdrawn from 51C, West Hartlepool shed, and was cut up the following month at Hughes Bolckows, Battleship Wharf, North Blyth. From 1869 the North Eastern Railway began to operate trains over the North British section of the ECML north of Berwick in exchange for the NB being granted running powers over the NER Hexham-Newcastle route to and from Hawick and Riccarton Junction. As a result the need to change locomotives and crew was no longer needed at Berwick. Intense competition with the West Coast main line (London Euston-Edinburgh) encouraged the acceleration of ECML services from the 1880s and apart from the disruption caused by the two world wars, speeds and frequencies have steadily improved. Reflecting the limited stops made by express trains a notable feature of the ECML in Northumberland was the provision of water troughs at Lucker enabling steam locos to take on water without stopping. The ECML has hosted some of Britain’s fastest scheduled services such as The Flying Scotsman and The Talisman. The Flying Scotsman was allowed 9½ hours between the capital cities in 1876, reduced to exactly four hours in 2015. Regular weekday ‘inter-city’ Newcastle-Edinburgh northbound trains increased from 17 in 1961 to 38 in 2015. Prestigious motive power has hauled ECML trains, notably streamlined A4 Pacifics from 1935-61 and Class 55 ‘Deltic’ diesels through the 1960s and ‘70s. From the late 1970s Class 43 ‘Inter-City 125’ workings were introduced, and with electrification of the route in 1991 Class 91 locos have taken over the services. Local passenger trains were steam-operated until about 1960. Since then, despite electrification, DMUs have provided the local service. On weekdays in 1950, prior to the closure of many of the minor stations, three trains ran each way between Newcastle and Berwick, calling at most stations, with four further Newcastle-Alnwick trains. Additional ‘semi-fasts’ typically called at Morpeth, Alnmouth, Chathill, Belford and Beal. By 1965 no local Newcastle-Berwick service operated, although most of the four Newcastle-Alnwick trains called at intermediate stations. When the Alnwick branch closed in 1968 two local weekday trains continued between Newcastle and Alnmouth in each direction, and certain Newcastle-Berwick trains called at selected intermediate stations. In summer 1968 Chathill’s service was reduced to two down and four up calls, and Cramlington and Pegswood had three in each direction. Since May 1978 the weekday Newcastle-Morpeth service has run approximately hourly. North of Morpeth, Northumberland’s ECML weekday ‘stopping’ service is now almost extinct. In 2015 Chathill is the remarkably obscure terminus of these Northern Trains operations, and there are only two in each direction on weekdays only. At 07:08 there is a Monday-to-Friday departure from Chathill to Newcastle (07:10 on Saturday) and a 19:10 Monday-to-Friday train to Hexham (18:36 to Newcastle on Saturday). Northbound trains on Monday-to-Friday from Newcastle terminate at Chathill at 06:46 and 18:49, and on Saturday at 06:50 and 17:59. It is therefore impossible to travel directly between Chathill and Berwick, but even a 1965 British Rail census showed that no southbound passengers alighted at Chathill and no tickets were booked there for northbound journeys. The local trains shown to terminate at Chathill actually travel 5¾ miles further north to cross over to the southbound track at Belford. There have been requests from Belford people to have their station (closed in 1968) reopened so they can take advantage of the trains which have to stop there on a non-revenue earning operation. The main line platforms at Alnmouth are seen on this undated view, looking north from the down platform. The extensive, glazed verandahs were installed in 1887-88 by the North Eastern Railway, and are similar to those provided at Heaton and Elswick stations, also in Northumberland. The station is still gas-lit; the LNER later installed electric lighting with name tablets. No.723 was a Worsdell-designed Class D20/1 4-4-0 locomotive, built by the North Eastern Railway at the Gateshead works in November 1906. The locomotive was re-numbered 2377 by the LNER, then 62377 by British Railways. Her life was short under BR, being withdrawn on 31 May 1949 from 52D, Tweedmouth shed, to be broken up the following month at BR’s Darlington works, North Road. Several passenger-carrying lines connected with the ECML in Northumberland. In Newcastle the ‘Riverside’ branch (closed to passengers in 1973) left between Manors and Heaton to follow a tortuous path along the River Tyne via Carville to Percy Main – Click on Carville to access station details on this route – and beyond Heaton , as mentioned above, the suburban route continues to North Shields, Tynemouth and Whitley Bay; most of this route has been adopted by the Tyne & Wear Metro. The former Blyth & Tyne Railway crosses the ECML between Heaton and Forest Hall, and there were at one time three curves to it from the main line; this route is also now used by the Metro. At Morpeth the North British Railway’s Wansbeck Valley route from Rothbury , Reedsmouth and Riccarton Junction reached the ECML , the outcome of that company’s intention to cross the ECML and join the Blyth & Tyne route from Morpeth to Bedlington, and so reach the port of Blyth and Tyneside without using the metals of the North Eastern Railway, of which the YNB became a constituent in 1854. The Morpeth-Bedlington line closed to passengers in 1950 followed by the Morpeth-Rothbury/Reedsmouth lines in 1952. Once again, click on the highlighted stations for details of these routes. North of Chevington a short branch served Broomhill and Amble (closed 1930) and the Alnwick branch closed in 1968: its extension to Coldstream carried passenger trains until 1930. At Chathill the North Sunderland Light Railway branch extended to the coast at Seahouses, and it maintained its independence until closure in 1951. Finally at Tweedmouth the line to Kelso and St Boswells left the ECML; it was a YNB (later NER) route as far as Sprouston Junction – an end-on connection with the North British Railway, several miles into Scotland. This line closed to passengers in 1964. There were plans in 1919 to create a Newcastle-avoiding route from the ECML between Heaton and Forest Hall across the River Tyne to the ‘Old Main Line’ near Pelaw, particularly for freight use. In the previous decade the King Edward Bridge had opened over the Tyne to provide a direct route for ECML trains to call at Newcastle Central without the need to reverse, but rail approaches to Newcastle Central continued to suffer from congestion. The 1919 project envisaged a triangular junction on the ECML close to the Coast Road (A1058), and the route would pass through Walker, with connections to the Riverside Branch; it would then cross the Tyne at St Anthonys on a double-decker bridge, provided with a lower road and tram deck before joining the Leamside line near Pelaw. A large freight marshalling yard would be constructed near Washington. In 1922-23 the NER/LNER bought a 53⅓-acre strip of land for the route, and the layout of roads in adjacent housing estates under construction was adapted to minimise crossings of the proposed railway. However no progress was made with the line, and it was clearly ‘dead in the water’ by the late 1940s. To this day the route of the ECML diversion can still be discerned as a stretch of allotments and open space. In the afternoon of 17 April 1979 Class 55 ‘Deltic’ No.55018 'Ballymoss' heads a northbound express through Chathill station; the same loco headed a southbound train which called at Chathill at 18.33. The stately building on the down platform, far right, is one of the series designed by Newcastle-based architect Benjamin Green. On the up platform is a stone-built waiting shelter. The footbridge is the standard NER design, and the same company installed the N1-style signal box c1873 which was in operation until December 1990. The footbridge was dismantled as it gave insufficient clearance for the wiring in the 1991 ECML electrification. From 1898 until 1951 Chathill was the junction for the Seahouses branch whose passenger trains were accommodated at the rear of the up platform, from which this photograph was taken. This was one of the last stations to retain NER oil lanterns, one of which is in the foreground; electric lighting was installed by 1988. Chathill (with 11 passengers per day) survived closure enquiries in the mid 1960s which resulted in Belford (10 passengers per day), Beal and Alnwick closing to passengers in January 1968, and Chathill is still open despite handling few passengers, estimated at about 2,800 in the year 2012-13; this represents a daily usage similar to the mid 1960s survey. The station is the unlikely terminus of Northern Rail services, with two weekday calls, one in early morning and the other early in the evening. Trains continue, unadvertised, to Belford station where they cross to the other line and reverse; Belford station remains closed despite local calls for it to reopen as the local trains actually stop at this point. Chathill station’s structures are Grade II listed. The station building is in residential use, bedecked with BR(NE) signs including recently manufactured totems – the station never carried them – and the up waiting shelter is nicely restored. Stations between Newcastle and Berwick were numerous and closely spaced, on average only two miles apart. Almost all were the work of Benjamin Green, a Newcastle architect who with his father, John, designed two of Newcastle’s most noble structures, the Theatre Royal and Grey’s Monument. The stations were generally elegant and of generous size; Fawcett (2001) opines that these were some of the most handsome wayside stations ever built. We can be grateful that, although George Hudson’s profligacy and financial misbehaviour were eventually his undoing, his willingness to spend generously on the Newcastle & Berwick stations gave us these station buildings, many of which have survived after closure as they were solidly built and suitable for conversion to residential use. The style was Tudor/Jacobean, or ‘Jacobethan’, which was popular in the 1830s among designers of country houses, and part of the appeal of these stations was that, although they had a family resemblance, they were not identical. Hallmarks were the buff-coloured sandstone (Northumberland freestone), prominent chimneystacks, and ball finials on gable ends. Befitting their importance Morpeth and Tweedmouth were given the most lavish and spacious buildings. The larger style usually contained two dwellings, one for the stationmaster and the other for the porter. Some buildings were reminiscent of manor houses, with an H-plan whose cross-wings enclosed a verandah. There were distinctive raised gables (as at Acklington, which remains open), but Tweedmouth was alone in being given shaped (‘Dutch’) gables. A further design (as at Chathill - still open) had a central projection towards the platform ending with a two-storey bay, topped by a gable resting on corbels; here, the second dwelling was built as a wing. Particularly grand stations were provided at Morpeth, Warkworth, Belford and Tweedmouth. Smaller stations, Widdrington (still open) and Scremerston had overhanging eaves with attractive bargeboards and resembled picturesque cottages. Smaller still were crossing houses, as at Newham, consisting of semi-detached dwellings with dormers. Some minor stations (e.g. Lucker) had spectacularly lavish buildings, but Cramlington (still open) had something much more modest. The original Berwick station - designed to look like the castle which was demolished to make way for it! – was of North British provenance, but was replaced by the LNER in 1927. 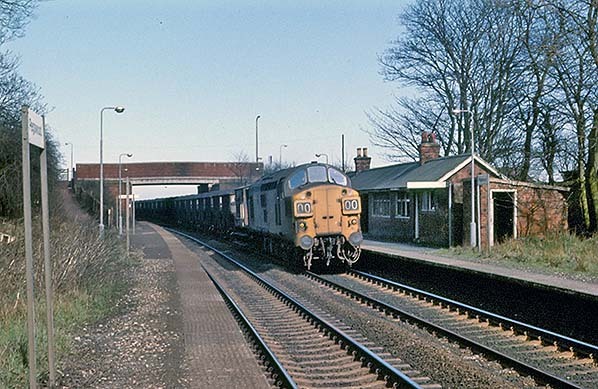 A Class 37 diesel hauls a southbound coal train through Pegswood station on 6 April 1977. This station opened in 1903 to serve a colliery village and received an over-track building and waiting shelters on each platform, all of brick construction and of austere design. 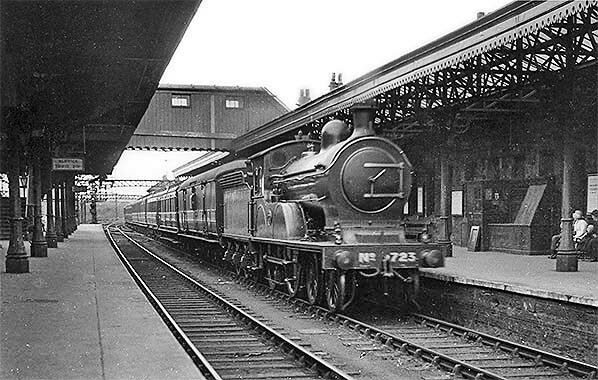 By the 1950s the station had a paltry train service and was considered for closure in 1958 (when ten of the ECML Northumbrian stations closed) and again in 1966, when a survey identified only six regular users, and the TUCC report did not state clearly why its retention was recommended, while Belford, Beal and Alnwick were to close. In 1972 only 3,888 tickets were issued at the station. It remained staffed in the mornings until the end of the 1970s, latterly issuing tickets from a small booth on the up platform. By the late 1960s the over-track building had been removed, when the bridge was rebuilt, and in 1977 on this photo only the semi-derelict up platform building survives; it was removed by 1990. Electric lighting and small Corporate Identity nameboards had recently been installed at the time of this photo. Pegswood station still clings to life, with two up weekday departures (one in the morning and the other in the evening) and one late afternoon down departure. In the year 2011-12 only an estimated 1,904 passengers used the station. To the sixteen original stations between Newcastle and Tweedmouth, others were added, usually alongside crossing cottages, as at Goswick. Entirely new stations included Dudley (1860: renamed Dudley Colliery, then Annitsford),which closed in 1878 when Annitsford’s second station opened nearby, and Pegswood (1903). Early closures were Lesbury (1851), Ashington Colliery Junction and Crag Mill (1877) and Dudley (1878). Closure of Smeafield and the private station of Fallodon came in the 1930s. Closure of stations in World War I was common, but exceptionally several lightly-used ones on the ECML were closed in World War II: in 1941 advertised trains ceased calling at Longhoughton, Little Mill, Christon Bank, Newham, Lucker, Goswick and Scremerston, but they all reopened in 1946. From 1950 closures resumed, affecting, in quick succession, Newham (1950), Longhirst and Scremerston (1951) and Lucker (1953). A purge of Kings Cross-Berwick minor stations took place in 1957-59; ten disappeared from the timetable on 15 September 1958: Forest Hall, Killingworth, Annistsford, Plessey, Stannington, Chevington, Warkworth, Little Mill, Christon Bank and Goswick. Although Pegswood was considered for closure at that time it was reprieved, only to be listed for closure by Beeching (1963), but it somehow remains open today. Longhoughton closed in 1962, followed by Beeching-listed Tweedmouth, along with the Kelso and St Boswells line, in 1964. In March 1966 British Rail published closure proposals for Pegswood, Widdrington, Belford, Beal and the branch to Alnwick; Barbara Castle, Secretary of State for Transport, refused to allow Pegswood and Widdrington to close, but consented to Alnwick, Belford and Beal which closed in 1968. The enquiry into the 1966 proposal drew objections as well as the question of why Chathill station was considered worth saving whilst the substantial village of Belford would lose its station. One further closure was Heaton (1980) for which Byker and Chillingham Road stations were substituted nearby on the new Metro line. 70013 'Oliver Cromwell' powers across the Royal Border Bridge under stormy April skies with 'The Great Britain V' day one on 21st April 2012. Whilst in the 1970s many British stations, particularly those which were de-staffed, were ‘simplified’ with demolition of their buildings, all of the 1947 ECML Northumbrian stations were spared, and electric lighting and Corporate Identity signage were installed. Until then most stations still had LNER wooden running-in nameboards with raised metal lettering, latterly repainted in black-and-white. British Railways totem signs were scarce, appearing only at Berwick-upon-Tweed; the next station south to carry them was Ferryhill, between Durham and Darlington. Among the open stations only Manors, Pegswood, Cramlington and Alnmouth have had their buildings demolished; a modest structure containing booking and waiting facilities was provided at Alnmouth to replace the former building. Between Newcastle and Berwick only Morpeth and Alnmouth (now suffixed ‘for Alnwick’) stations are staffed. Of the disused stations, the following have retained Victorian buildings: Stannington, Longhirst, Chevington, Warkworth, Christon Bank, Belford, Smeafield, Goswick and Scremerston. The branch terminus at Alnwick is also preserved and in use as a second-hand bookshop.